Protecting you and your family is our top priority. From scheduling your initial consultation to the follow-up after every project, we treat your family and home as if it were our own. We understand how stressful times can be after a storm. That’s why we guide you through every step of the process while also taking the nitty-gritty repair and re-roof work off your hands to bring you the ultimate peace of mind. Once we arrive on-site, we assess your property and roof to put together a comprehensive plan that fits your specific needs. Our team is highly-trained to inspect every aspect of the roof so once we begin, we can execute efficiently and ensure your roof is durable, effective, and ready to provide the ultimate protection against the elements. What makes Striker Roofing & Construction unique? We use the industry’s top products, backed with a lifetime warranty on almost everything, so you can rest assured for future storms. Additionally, our team has the extensive expertise to help families with post-storm damage, with hundreds of roofs replaced annually. And because our goal is to get you back to everyday life as soon as possible, we work efficiently without compromising quality. To move quickly, we establish partnerships to have materials available even when supplies in a storm-hit area are limited. That’s why we’re ready to fix all types of roofs with any color shingle. 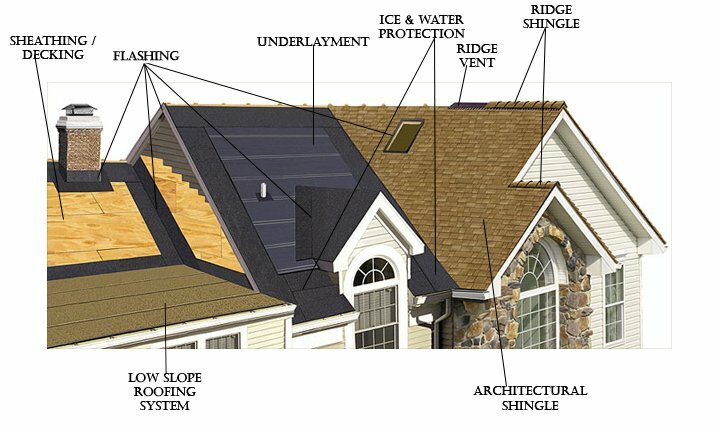 Lastly, our roofing systems use many materials that add value and protection for your home, including sheathing/decking, flashing, underlayment, ice and water protective barriers, ridge vents, ridge shingles, and other venting. Ready to see why customers choose Striker Roofing & Construction? Contact us for your free estimate today!